2.4 GHz spread spectrum radios have taken the RC world by storm. Spread-spectrum technology is now the standard on all but the cheapest and lowest quality toy grade RC radios. So what is spread-spectrum-radio modulation and why is it so good? To answer this question, let’s first look at the other ”narrow band” modulation methods – AM, FM/PPM, and PCM. AM, FM, and PCM all use narrow band radio transmission. This simply means they transmit a signal on a specific frequency within the radio spectrum. This is exactly the same way AM and FM radio stations broadcast and is why you have to tune into a specific frequency (radio station) to get reception. The RC world uses radio frequencies in the 27 mega hertz (MHz) to 75 MHz range. 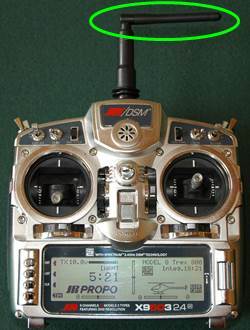 Most hobby grade RC aircraft used the 72 & 75 MHz band range of the radio spectrum. For your RC radio system to work, the receiver must be tuned into the exact same frequency as the RC radio, this allows several models to be flying at once provided they are all on different frequencies within the allowed band range. Over the years, technology has made it possible to “cram” more frequencies into this specific 72 & 75MHz range, but space is limited, and there lies the problem. With only a few dozen channels or so available, it is very important that only one person be transmitting on a specific channel at a time. This is what frequency boards and pins at RC flying clubs are used for. When it is your turn to fly, you take the frequency pin off the board and this lets others know that frequency is in use. Simple in principle, but with more and more people flying RC and computerized radios that need to be programmed, there is always the possibility that another RC radio on the same frequency will accidentally be turn on while you are flying – interference and crashing is the result. Spread spectrum radios as the name suggest are not bound by narrow band frequencies; they spread their radio signals out over a large range of the radio spectrum. They also use a much higher frequency range 2.4 GHz. That is a frequency of 2.4 billion cycles per second. This is well beyond the range of most RF (radio frequency) generated noise that occurs below 300 MHz making 2.4 GHz much more immune to interference issues. Before I get going on exactly how a spread spectrum radio works, let’s first look at how narrow band RC radios transmit their signals. AM stands for amplitude modulation. This is the most basic and very first method used for controlling RC models. AM RC radios send information to the model by changing the amplitudes of a base carrier wave at a specific frequency. It is then a simple mater for the receiver to filter the highs and lows of the changing amplitudes of the carrier wave into usable information. The problem is it is really easy for those amplitude highs and lows to be affected by almost any electrical noise generating device. Any type of electrical or metal on metal noise from lighting to car ignition systems will result in interference (just listen to an AM radio station while an electric motor in your house is running or an electrical storm is approaching – big time noise). It is all these sources of interference that will cause loss of control issues on your RC model. 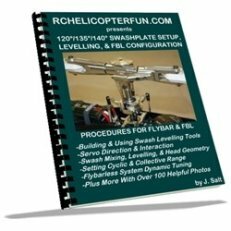 This holds especially true for all types of RC helicopters with the many metal on metal contact points, electronic speed controllers and motors in electric RC helis , and high voltage ignition systems on gas powered RC helis . 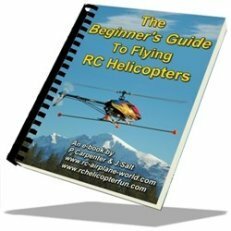 Bottom line – stay away from AM RC radios for RC helicopters at all costs. I guarantee you will have interference issues. Yes I know this from experience. FM stands for frequency modulation. It is also referred to as PPM – Pulse Position Modulation and was introduced commercially to the RC aircraft world in the early 80’s. FM sends information by changing the frequency of the radio wave instead of the amplitude. Because the receiver is now looking for changing frequencies instead of changes in amplitude, any electrical noise source that changes the amplitude of the carrier wave simply won’t be seen by the receiver. 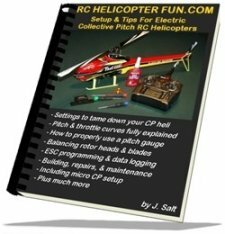 I started out using a FM RC radio on my first nitro helicopter and it worked okay most of the time. However, there are many rotating parts than can sometimes send out electrical noise that can be interpreted by the receiver as a legitimate signal and cause a “glitch”. So every now and then the heli would twitch. If the glitch was bad enough or lasted more than a few seconds... well you get the "ugly" picture. Yup - I moved up to PCM almost 20 years ago and never looked back. PCM stands for Pulse Code Modulation and works by embedding a digital signal within the basic FM radio wave. A digital processor chip inside the RC radio will encode a digital transmission and send it out on a standard narrow band FM carrier wave. The receiver also has a processor chip that decodes this digital data back into a usable analog signal for the servos. Think of this like hearing a bunch of people talking to you in different languages but you only understand one of those languages. Our brains have the ability to filter out all the other noise and only respond to the information from the language we know and understand. This method all but eliminates any glitching caused by electrical noise because unless the receiver “hears” a digital command that it understands, it won’t respond. It is this ability to ignore outside interference that makes PCM so perfect for all kinds of RC control – especially for helicopters. This brings us to the topic of “Fail Safe”. Like I just mentioned, a PCM RC radio receiver can ride out interference because it doesn’t understand it and simply ignores it. This makes it possible to add a secondary feature to that ability. Fail Safe is a safety function that allows you to “tell” or “teach” the receiver what to do if it no longer sees or understands the radio signals it receives. No, this doesn’t mean the receiver is capable of flying and then landing your helicopter if there is radio signal corruption, but it will move the servos to a predetermined value. For safety reasons that usually means throttle off and all other control functions at neutral or perhaps last position. So does all that mean that PCM RC radio systems are immune to interference? I am afraid not. If another PCM radio is transmitting on the same frequency, you will certainly get interference – your receiver will see conflicting signals. Even a standard FM (PPM) RC radio will cause loss of control issues if it’s on the same frequency. Your PCM receiver won’t understand this FM noise of course, but it also won’t be able to “hear” your PCM radio’s digital voice over all the noise (called high noise floor in the RF world). Let’s go back to the illustration of all those people talking to us in different languages. If there are too many, the noise floor is so bloody loud, you can’t hear the person talking to you in your own language right? Communication is lost. Welcome to the 2.4GHz spread spectrum radio REVOLUTION! 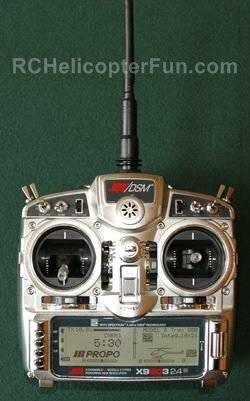 No other advancement in RC radio technology has changed our hobby in such a profound and positive way. As big as PCM was – it doesn’t come close to the freedoms that all spread spectrum radios have. Interference issues are more or less all gone! No more frequency conflicts! No more Worries! Actually, the RC radio world has been rather slow to adopt 2.4GHz spread spectrum technology considering it has been commercially available since the 90’s with cordless phones, cell phones, and later wireless computer technologies such as Wi-Fi and now Bluetooth. In fact, spread spectrum was co-invented way back during WWII to prevent radio signal jamming of torpedoes by a fairly famous actress of the day. The main idea behind spread spectrum is to spread the radio transmission out over a wider range of the radio spectrum - thus the name SPREAD SPECTRUM. This makes a spread spectrum signal much less likely to run into interference or jamming issues that are common with all narrow band radio transmissions. Even many spread spectrum radios all transmitting at the same time are very unlikely to interfere with each other as the spread of radio signals are random, changing, or coded. In most cases any signal conflict happens for such a brief moment, you never even notice it. How Does A Spread Spectrum Radio System Work? There are essentially two different types of spread spectrum technologies that today's 2.4GHz RC radios use... FHSS & DSSS. FHSS is exactly how that first WWII spread spectrum system worked. Frequency hopping, as the name suggests, transmits within a specific frequency band (such as 2.4 GHz), but changes the precise frequency of the transmission hundreds of times a second. It's kinda like switching between channels on your TV (channel hopping) if the same show was on several different channels at the same time and you were trying to avoid any commercials for a commercial free watching experience. The commercials in the TV example here are interference. For FHSS to work, the receiver has to know the frequency changing pattern so it can hop to the different frequencies in the same order and time frame as the transmitter does. The time spent on each specific frequency is so short, even if there was interference on several of the frequencies, it changes so quick, you wouldn't detect it. FHSS theoretically has better interference immunity than DSSS as more channels are used to hop around on but the flip side of that coin is a FHSS only RC radio would have very poor/limited range due to something called "Process Gain". Yep, even radio brands that "market" their radios as using FHSS technology are not telling us the whole story since they also use DSSS. All our spread spectrum RC radios use DSSS technology. Some combine it with FHSS is all. Unlike frequency hopping, direct sequence as the name suggests uses random PN code sequences and picks one or more pseudo randomly selected frequencies out within the band (such as 2.4 GHz). The idea is with several randomly selected frequencies, along with random code sequences, it's very unlikely all of them would ever experience interference at the exact same time within the unique code sequence. Using our TV example from above, DSSS would be somewhat similar to watching several TV's with the same show on each TV all on different channels. At any one time, commercials will be on some of the channels, but never on all of them at the same time allowing you to watch your show commercial (interference) free by simply looking at (processing) all the TV images and ignoring any that were commercials. This brings us to DSSS main contribution our hobby - improved radio range. 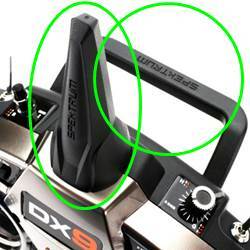 I touched on Process Gain above in the FHSS discussion, but this is why DSSS technology must be used in all 2.4GHz RC radio's regardless of brand. DSSS is capable of high bit processing speeds and the higher the bit process rate, the greater that range can be with a set amount of transmitter output power (which by the way is pretty low for off the shelf RC radios). It's not that a DSSS RC radio signal will travel any further out than the same powered signal using FHSS or just plain old 2.4GHz noise of the same power level; but due to the higher bit processing rate, it can process and extract more clean data packets out of that noisy environment - even as the signal gets weak at extended ranges. These are very, very basic explanations of both spread spectrum methods and for most of us, it's simply enough knowing that the systems work, and work well. If you want a more technical explanation of how both FHSS and DSSS work in relation to RC radio's, one of my web visitors (who is an accomplished electrical engineer) has written a wonderful article entitled "RC Spread Spectrum Demystified" and allowed me to share it on my site (click on that link to be taken to the article). It's a really great read if you truly want to understand how all our spread spectrum RC radios operate regardless of brand. It also puts to rest much of the marketing hype and misinformation floating around out there (I sure learned a few things that changed what I thought I understood after reading it). The video below also provides an easy to understand explanation of how DSSS works. You should know by now almost nothing in this world is perfect and spread spectrum radios are no exception. As I mentioned earlier, transmitting and receiving in the 2.4GHz high frequency range certainly gets you out of a fair amount of naturally occurring RF (radio frequency) noise that occurs below 300 MHz. You have probably also noticed that all 2.4GHz devices from cordless phones, WiFi routers, and of course RC spread spectrum radios have very short antennas. This is because the frequency or wave length is so short, a short antenna is all that is required to transmit and receive 2.4 GHz. This has made the long unsightly and usually difficult to route RC receiver antenna wire a thing of the past. It has also eliminated the long telescoping antenna that would always get bent on the RC radio. Unlike the longer wave lengths used in 27-75 MHz RC radios that pass through almost anything, 2.4GHz short wave lengths are easy absorbed or reflected by many objects just like a light wave. Absorption and reflection of the 2.4GHz signal by parts of the model aircraft could lead to fail-safe lock out control loss if the signal is not strong enough for the receiver to hear or identify if from shielding or reflecting. This is not so much of an issue with foam, fiberglass, or balsa fuselages; but it certainly can be a problem for RC helicopters or multi-rotors that use carbon fiber or aluminum side frames, etc. Carbon fiber gliders are also a 2.4 GHz challenge. By mounting at least two receiver antennas in different locations and orientations within the model (or on the exterior or carbon models), even a couple inches apart at a 90 degree angle to each other; pretty much ensures at least one of these receiver antennas will always “see” a clear & strong signal. By having two or more receiver antennas placed in different orientations, no matter how the aircraft changes position in the sky, one of the antennas will have enough longitudinal exposure to "see" & receive the radio waves from your radio's transmit antenna. I cover this in much more detail on my RC Antenna page, which will give you a solid understanding of how 2.4 GHz RC antennas work, along with best placement practices. Transmitter antennas radiate RF out of the sides of the antenna, not out the tip, the same way receiver antennas receive RF along their length. This is why you will often see people flying with their 2.4 GHz antenna bent sideways on the radio. When the antenna is straight, there is a null zone out the tip where the RF energy is not that strong; so if you always fly with the tip on the antenna pointed directly toward the aircraft, you are going to limit your flying range. Bend it sideways and more RF energy reaches the aircraft; provided when you fly to the right of your position (if the antenna is bent to the right as in the picture), you pivot your body or radio to remain facing the aircraft. Remember, there is that null zone of weak RF energy out the tip of the antenna so as the aircraft flies a long way downfield to the right, it's going to be flying into that right side null zone. This is why the latest generation of spread spectrum radios sometimes use two antennas on the radio (one pointing up vertically and one in the back handle positioned 90 degrees horizontally). Just like having dual receiver antennas placed in different orientations onboard the aircraft to improve diversity; doing the same thing with the transmitter antenna also improves diversity. With this arrangement, you don't have to worry about which way the radio antenna is pointed. When the aircraft is right out in front of you or directly overhead, the horizontal handle antenna will be proving the most RF energy back to the aircraft. As the aircraft flies a ways down the field to the left or right, now the aircraft will be seeing the most RF energy from the vertical antenna. As I mentioned before, if you really want a solid understanding of the meat and potatoes of how spread spectrum technology works with our current brands of 2.4GHz RC spectrum radios. David Buxton's "RC Spread Spectrum Demystified" article is a must read!